talkhealth > Blog > 2013/08 > Do you hate the term ‘allergy or eczema sufferer’? A while ago a reader commented that the header on the What Allergy? blog website was very negative as it said, ‘For anyone suffering with food allergies and intolerances’. I realised then that I had been using the word ‘sufferer’ without really thinking about what it meant. I actually agreed with Robin, the reader who felt driven to write to me about my website header. However I have only today managed to purge my website of the offending negative word, sufferer. The header now reads, “For anyone living with allergies, eczema and asthma” which I think works better. We have to live with it but we don’t have to suffer. Well, apart from the eczema flare-ups and the allergic reactions which plague us; but we can choose to take a positive stance, get on with life and live with it as best we can. So we don’t suffer our allergies, we live the best, safest and most positive life that we can despite them. If we suffer our allergies we allow negative thoughts to pervade and this leads to low self esteem, depression and greater feelings of loneliness, isolation and pain. And we’ve all been there. That little voice in your head that picks away. The ‘why me’ voice. So if you do use the word sufferer – try to use a different word from now on. Is it time we all purged the term ‘sufferer’ from our vocabulary? It is time for the the media to purge “allergy sufferer” from its lexicon. As you are aware, terms to refer to the disabled and other minorities have evolved over time to replace negative terms with more progressive ones. The term “allergy sufferers” is outdated, considered derogatory and reinforces negative stereotypes. Further, language shapes an issue. If one sees a person with a disability as a “sufferer”, then one does not feel obliged to try to address that person’s needs. The inference is that the person will suffer, regardless of efforts, and that the person is a tragic figure. Many people with allergies lead full, productive lives and do not suffer the majority of the time. They live with allergies just as others live with all kinds of conditions. The government of Canada and a number of other agencies produce guidance material that suggests alternatives and explains why the term is flawed. Further, journalistic style guides are cited below. Note: People with disabilities do not necessarily suffer. Avoid categorising people with disabilities as either super-achievers or tragic figures. Choose words that are non-judgmental, non-emotional, and are accurate descriptions. Avoid using “brave,” “courageous,” “inspirational,” or other similar words to describe a person with a disability. Remember that the majority of people with disabilities have similar aspirations as the rest of the population, and that words and images should reflect their inclusion in society, except where social isolation is the focal point. Avoid references that cause discomfort, guilt, pity, or insult. Words like “suffers from,” “stricken with,” “afflicted by,” “patient,” “disease,” or “sick” suggest constant pain and a sense of hopelessness. While this may be the case for some individuals, a disability is a condition that does not necessarily cause pain or require medical attention. Be particularly careful with terminology in titles or headlines, since they make the first impression. It is not only government agencies that see “sufferers” as harmful. The Canadian Association of Broadcasters, Recommended Guidelines on Language and Terminology – PERSONS WITH DISABILITIES, A Manual for News Professionals at http://cab-acr.ca/english/social/diversity/disabilities/pwd_guidelines.htm explains the rationale. Similarly, these guidelines suggest avoiding references to persons with disabilities that patronise, pity, victimise or insult. These include terms such as ‘suffers from’, ‘was stricken with’, ‘is confined to’ or ‘is afflicted with’ that tend to label persons with disabilities as in pain, ill or having a condition requiring constant medical assistance. In fact, this is usually not the case. Defect, defective: Avoid using these words to describe a disability. An example that could be considered offensive is: “She suffers from a defective leg.” Instead, state the nature of the disability or injury. What can you say? A “person with allergies”, “has food allergies”, in some cases “allergic disability”. Avoid “allergy patient”, as this suggests a condition that is in constant need of medical attention. In my complaint, I ended with this wording “I would appreciate a response regarding whether you plan to change you style guide in light of this information. Its use does not reflect well on your organisation and it does harm to the cause of those of us with allergies who are striving for a more inclusive world.” That is probably not right for your blog, but it might be good to urge your readers to spread the word, and write to media outlets whenever they see the term. I have received positive responses that said the term slipped through by mistake and was not consistent with their policy and thanking me for the reminder. So thank you Robin for your thoughts on the much over-used term, sufferer. Do you use this word to describe people with allergies? Do you agree that using more positive of factual descriptions helps to give a more rounded understanding and avoids negative stigma and offence? So do you hate the term allergy sufferer? or are you not bothered at all? This also touches on the subject of disabilities. Do people with allergies have a disability? We could chat about this for hours… So what’s your view on the subject? Let’s have a heated debate! 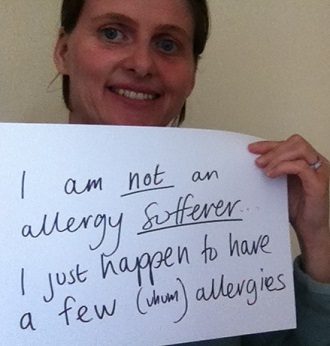 2 Responses to Do you hate the term ‘allergy or eczema sufferer’? It’s very easy to call people sufferers. At talkhealth we’ve also battled with the term. We now, like you, use ‘living with’ or ‘affected by/with’. Thanks for this blog which is interesting and very thought provoking. I too try not to use it. And I know sometimes people with an illness like allergies or anything else where the symptoms do suffer when they are having a flare up ro reaction, but on the whole, we learn to cope, learn to avoid triggers and learn to live with the condition, and we don’t want sympathy. We hate it when people say stuff like, “How on earth do you cope? How do you live like that?” because well, we just have to. We don’t have much choice. It’s the only option. Learn about it and get on with it. Kindness and support are always welcome but not comments about sufferers or too much horrified pity. When I’m avoiding my allergens I’m completely healthy and probably healthier than most.